I also own a Itasca Meridian by Winnebago, they are great rigs! I power wash mine once a year. I have never waxed it but if you really want to you could Wade Wax your roof once a year. However- it will make it slippery so I don’t recommend it, it’s just not worth the time or risk. It’s a roof!! 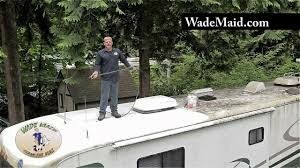 You don’t wax the roof of your house or any other roof and Winnebago has a great warranty on it. So why waste your time and energy on it when you could be enjoying life instead? As far as walking on your roof, you have the rig for that! Race car fans use the roofs as viewing platforms complete with chairs, tables and ice coolers. Just don’t step on a vent or skylight. 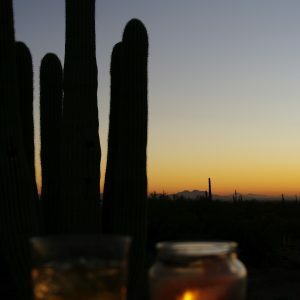 As you can see I have enjoyed many sunset views from the roof of my unit. So, my advice is to use Wade Wax on the sidewalls of your rig, keep your roof washed, and enjoy life! I have a Itasca Meridian 2011 40ft diesel with a fiberglass roof. Condition of roof excellent to very good. What would be the best product to clean it with? How do I protect it? Do you wax them or just clean it? Is it ok to walk on the roof? Do you know if there only certain areas to walk on with this model?